中二病でも恋がしたい！/ Chu-2 byo demo KOI ga shitai! 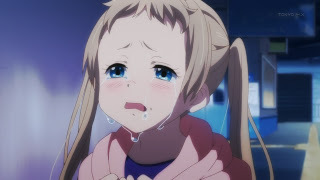 Three weeks after Rikka removes her eye patch and contact, Tōka packs to move to Italy and is seen off by Rikka, who addresses Tōka as “oneechan”, Yuuta, and his siblings. 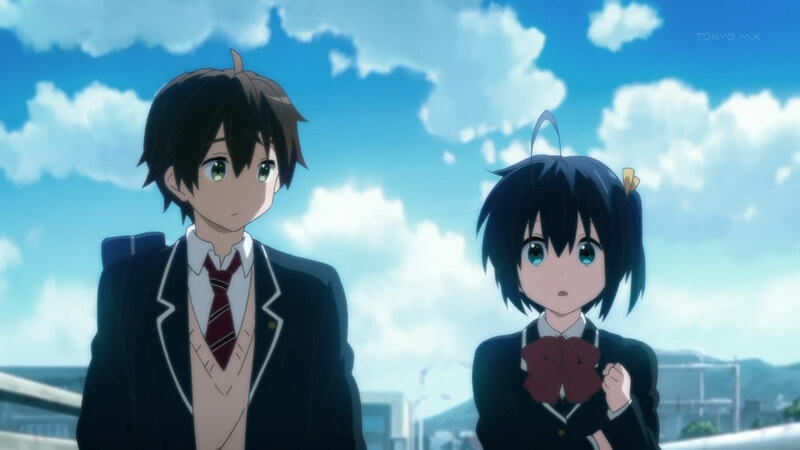 The following day when Yuuta and Rikka walk to school, she’s still struggling to use “normal” speech patterns, even going to far as to address Yuuta as “Yuuta-kun”. 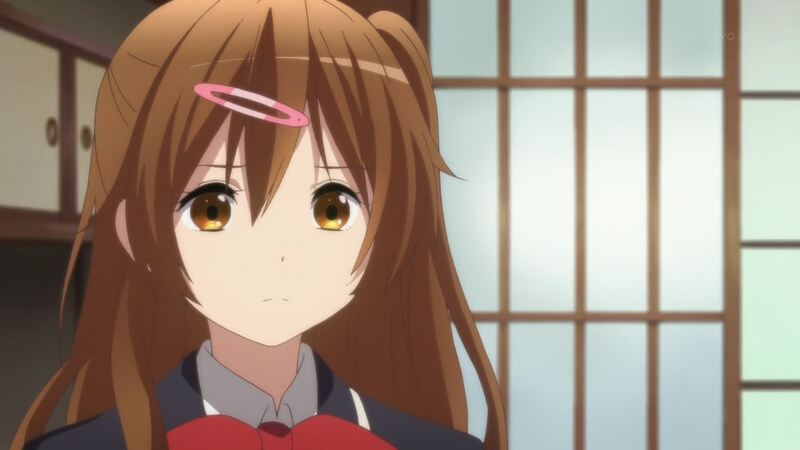 A frustrated Sanae is waiting for them on a bridge, where she challenges her master in order to exorcise Rikka. Sanae enters chuunibyou mode, but since Rikka refuses to participate, Sanae ends up defeated and flees. Yuuta wonders if Rikka is really OK with this turn of events, but declines to say anything. At school, Rikka makes friends with other girls in the class, making Yuuta smile. Later, Nibutani and Yuuta are working in the school library and discussing things, leading Nibutani to wonder if Yuuta regrets forcing Rikka to face reality, which he doesn’t since it makes Rikka’s family feel better. In the club room, Sanae is very depressed as Makoto prepares a love letter for Kurin. Nibutani and Rikka arrive, so Sanae shows her the blue magic stones she acquired. 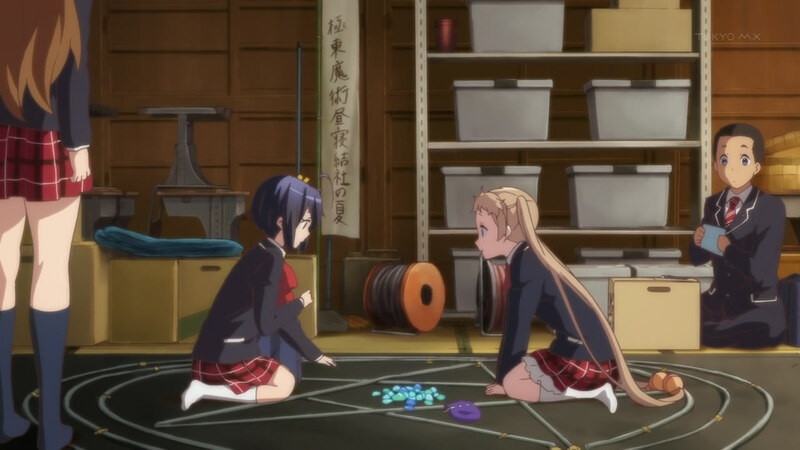 Rikka lights up at this, and again when Sanae puts them on the mandala, but Rikka turns away from this. Sanae is very upset and has to be dragged out by Nibutani, kicking and screaming all the way. Nibutani knows what she’s going through so in the hall, she gives Sanae a big, comforting hug. 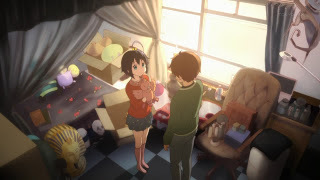 That night, Yuuta helps Rikka pack up all of the items she used in her chuunibyou fantasies, though she’s unsure what she can and can’t keep. After they finish, Rikka suggests they go out for dinner, so they get convenience store onigiri and stuff and eat under a bridge by a river. She tells Yuuta that her mama wants to take her to Papa’s grave, but she wants to know what he thinks she should do. After a long pause, he asks her what she thinks she should do. Since she figures it will please Mama, Yuuta says she should go. Hearing this, Rikka puts down her onigiri and holds out her pinkie for Yuuta, who touches it with his. She then leaves to go home first. While running home, she encounters Kurin in a car, who has the cat Rikka had rescued after coming back from the vet’s office. After pondering things that night, Yuuta goes to the train station to see Rikka off the next day. After buying her a drink, he asks her if she’s planning to come back. She seems a bit surprised by the question, but her face soon falls and she says that she has to because of school. 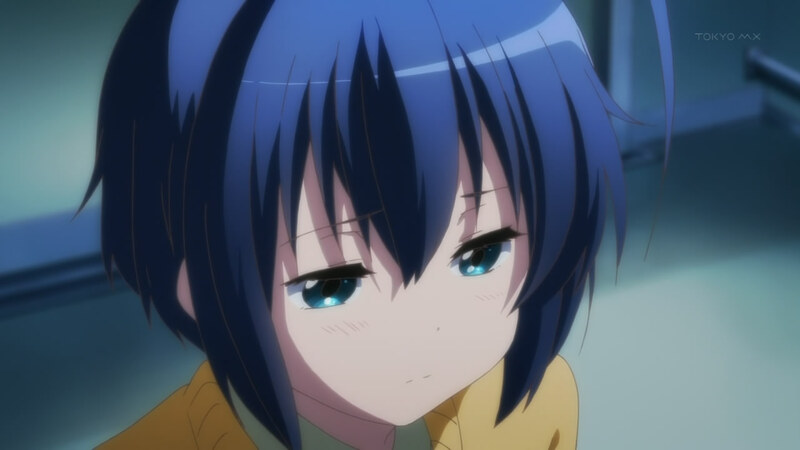 Sanae shows up, having vowed to never give up, and again attempts to engage Rikka in chuunibyou, but Rikka refuses to participate. 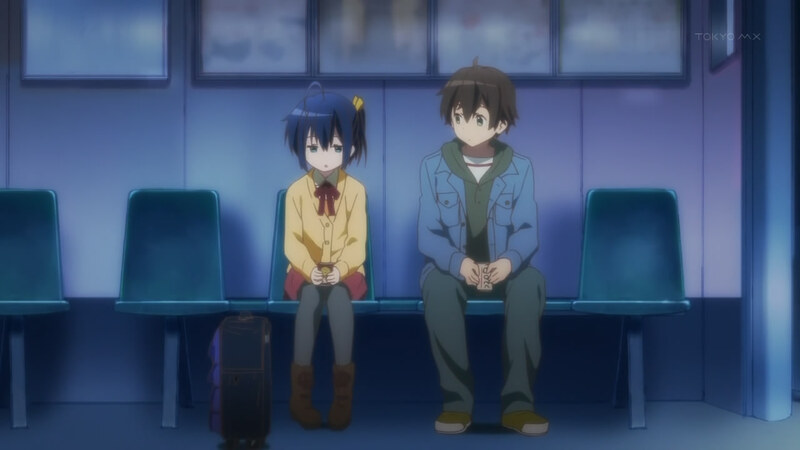 Rikka leaves but before the train door closes, she looks expectantly at Yuuta, but he doesn’t say anything. Sanae gets angry with Yuuta for not telling Rikka what she wanted to hear – that he’ll search for the Unseen Horizon with her. Sanae speaks of everything Rikka has told her, but Yuuta gets angry, saying that no matter what, they don’t have these supernatural powers. Under the force of his anger, she cries and concedes that she knows she doesn’t have any powers, then flees. Yuuta feels bad on how the conversation went. Egad. I don’t mind saying this, but this episode hit me unexpectedly hard, but this series has been surprising in a lot of ways. Until now, Sanae has been used primarily in a comedic role. I knew that Sanae would have trouble dealing with Rikka going normal, but I didn’t expect it to be this tough for her. I actually had tears for Sanae, because unlike a Key production, where they draw tears by marking characters for death, this felt so very real to me. Sanae was losing her best and only friend. 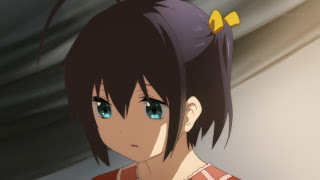 Rikka’s plunge into chuunibyou fantasies started with her father’s death, but culminated when she was visiting Tōka and witnessed Yuuta doing his Dark Flame Master stuff. (As an aside, I didn’t realize this before but I now know why Rikka moved in with her sister — Yuuta’s Dark Flame Master.) So, Rikka gets into the chuunibyou stuff and along the way, meets Sanae online, developing a deep friendship. That leads me back to Sanae. What little we’ve seen of her home life, she could almost be an ojousama type. She clearly lives in a nice home with nice things, so she’s pretty comfortable there. I’ve often wondered why Sanae went chuunibyou (though I think I’ve neglected mentioning that, though I meant to). 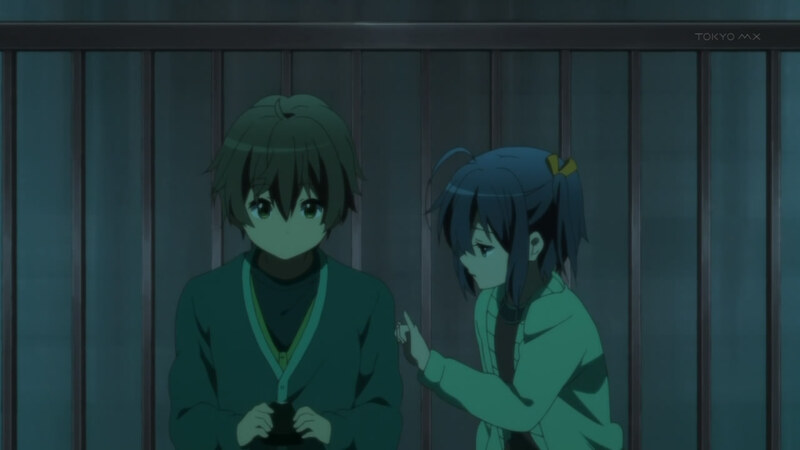 When she finally conceded Yuuta’s point, it hit me that for Sanae, chuunibyou is just fun. 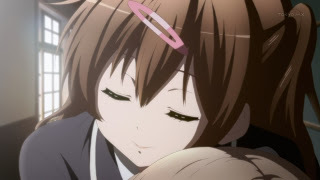 That’s why she’s been so brazen with her chuunibyou behavior at school. She can act normal, as seen when she’s helping classmates understand things they’d been taught. 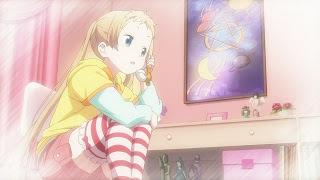 However, she doesn’t care who sees her acting out her chuunibou stuff, as seen when a middle school girl like her goes over to the high school with the sole purpose of irritating Nibutani, a senpai. 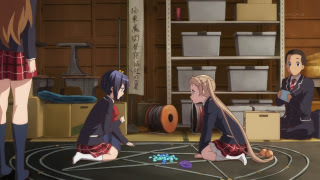 However, this chuunibyou stuff is not normal nor mainstream (though everyone has fantasies and even minor chuunibyou moments here and there), so Sanae apparently had no friends until she met Rikka. Rikka understood her like no other, and for all these episodes, we’ve seen Sanae happy and confident. As such, it makes Sanae losing Rikka as a friend so much more devastating, thus why I teared up in this episode. In the midst of Sanae being cut to pieces, dragged away by Nibutani, I loved how Nibutani embraced Sanae. In a way, Nibutani became Mori Summers in that moment. After all, it was reading Nibutani’s stuff, written as Mori Summers, that hooked Sanae. And speaking of Nibutani, it is interesting how she’s pretty much abandoned her attempts to be something she’s not, as witnessed by her dropping out of the cheerleaders squad and spending more time with the chuunibyou crowd. There’s not enough time to cover her in greater detail, which is a shame. However, she seems to be in a bit more comfortable place than Yuuta. After all, she’s the one who questions Yuuta on whether he regrets forcing Rikka to accept reality as she knows what he’s going through too. Finally, there’s Yuuta. All along, one can tell that at times, the person in him that enjoyed doing the chuunibyou thing still wants to do it. We saw that again when he helped Rikka pack up her stuff. on the other, he does know that at some point, people have to grow up. As such, he is in the unenviable position of having to force his girlfriend and her best friend out of their fantasy worlds. 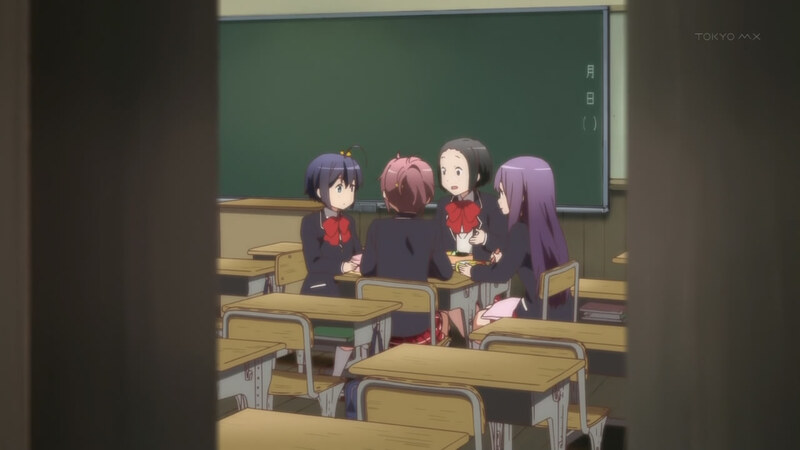 I figure that next episode, Yuuta might go after Rikka, but this series has been known to skip time. 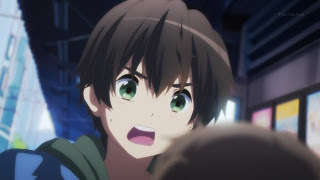 So if that doesn’t happen, Yuuta will come to a compromise situation, and he, Rikka, Sanae, and maybe even Nibutani will do the chuunibyou thing in the club room (keeping the club intact), but be normal in school or public. Thus, we come down to one more TV episode (and an OVA in the future) of this surprisingly good series. A lot of people hated this episode filed with drama, but I thought it was great and a necessity. You did a great review on it.